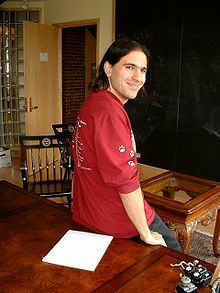 Nima Arkani-Hamed (Persian: نیما ارکانی حامد‎; born April 5, 1972) is an American-Canadian theoretical physicist of Iranian descent, with interests in high-energy physics, quantum field theory, string theory, cosmology and collider physics. Arkani-Hamed is now on the faculty at the Institute for Advanced Study in Princeton, New Jersey, and director of The Center for Future High Energy Physics (CFHEP) in Beijing, China. He was formerly a professor at Harvard University and the University of California, Berkeley. Arkani-Hamed's parents, Jafargholi "Jafar" Arkani-Hamed and Hamideh Alasti are both physicists from Iran. His father, a native of Tabriz, had worked for the Apollo program in the early 1970s, was chairman of the physics department at Sharif University of Technology in Tehran, and later taught earth and planetary sciences at McGill University in Montreal. Arkani-Hamed immigrated to Canada as a child with his family in the seventies. Arkani-Hamed graduated at the University of Toronto with a joint honours degree in mathematics and physics in 1993, and went to the University of California, Berkeley, for his graduate studies, where he worked under the supervision of Lawrence Hall. The majority of his graduate work was on studies of supersymmetry and flavor physics. His Ph.D. dissertation was titled "Supersymmetry and Hierarchies". He completed his Ph.D. in 1997 and went to SLAC at Stanford University for post-doctoral studies. During this time he worked with Savas Dimopoulos and developed the paradigm of large extra dimensions. In 1999 he joined the faculty of the University of California, Berkeley physics department. He took a leave of absence from Berkeley to visit Harvard University beginning January 2001, and stayed at Harvard as a professor from 2002-2008. Since 2008 he has been a professor in the School of Natural Sciences at the Institute for Advanced Study in Princeton, New Jersey. In 2003 he won the Gribov Medal of the European Physical Society, and in the summer of 2005 while at Harvard he won the Phi Beta Kappa award for teaching excellence. In 2008, he won the Raymond and Beverly Sackler Prize given at Tel Aviv University to young scientists who have made outstanding and fundamental contributions in Physical Science. He was elected to the American Academy of Arts and Sciences in 2009.. He gave the Messenger lectures at Cornell University in 2010, and is currently an A. D. White Professor-at-Large at Cornell University.. In 2012 he was an inaugural awardee of the Fundamental Physics Prize, the creation of physicist and internet entrepreneur, Yuri Milner. He was one of six physicists featured in the award-winning 2013 documentary film Particle Fever, and was elected to the National Academy of Sciences in 2017. N. Arkani-Hamed; S. Dimopoulos; G. Dvali (1998). "The Hierarchy Problem and New Dimensions at a Millimeter". Phys. Lett. B. 429 (3–4): 263–272. arXiv:hep-ph/9803315. Bibcode:1998PhLB..429..263A. doi:10.1016/S0370-2693(98)00466-3. I. Antoniadis; N. Arkani-Hamed; S. Dimopoulos; G. Dvali (1998). "New Dimensions at a Millimeter to a Fermi and Superstrings at a TeV". Phys. Lett. B. 436 (3–4): 257–263. arXiv:hep-ph/9804398. Bibcode:1998PhLB..436..257A. doi:10.1016/S0370-2693(98)00860-0. N. Arkani-Hamed; S. Dimopoulos; G. Dvali (1999). "Phenomenology, Astrophysics and Cosmology of Theories with Sub-Millimeter Dimensions and TeV Scale Quantum Gravity". Phys. Rev. D. 59 (8): 086004. arXiv:hep-ph/9807344. Bibcode:1999PhRvD..59h6004A. doi:10.1103/PhysRevD.59.086004. Arkani-Hamed, Nima; Savas Dimopoulos; Georgi Dvali (August 2000). "The Universe's Unseen Dimensions". Scientific American. 283 (2): 62–69. Bibcode:2000SciAm.283b..62A. doi:10.1038/scientificamerican0800-62. PMID 10914401. N. Arkani-Hamed; A.G. Cohen; H. Georgi (2001). "(De)Constructing Dimensions". Phys. Rev. Lett. 86 (21): 4757–4761. arXiv:hep-th/0104005. Bibcode:2001PhRvL..86.4757A. doi:10.1103/PhysRevLett.86.4757. PMID 11384341. N. Arkani-Hamed; A. G. Cohen; H. Georgi (2001). "Electroweak symmetry breaking from dimensional deconstruction". Phys. Lett. B. 513: 232–240. arXiv:hep-ph/0105239. Bibcode:2001PhLB..513..232A. doi:10.1016/S0370-2693(01)00741-9. N. Arkani-Hamed; A.G. Cohen; T. Gregoire; J.G. Wacker (2002). "Phenomenology of Electroweak Symmetry Breaking from Theory Space". JHEP. 0208 (08): 020. arXiv:hep-ph/0202089. Bibcode:2002JHEP...08..020A. doi:10.1088/1126-6708/2002/08/020. N. Arkani-Hamed; A.G. Cohen; T. Gregoire; E. Katz; A.E. Nelson & J.G. Wacker (2002). "The Minimal Moose for a Little Higgs". JHEP. 0208 (08): 021. arXiv:hep-ph/0206020. Bibcode:2002JHEP...08..021A. doi:10.1088/1126-6708/2002/08/021. N. Arkani-Hamed; A.G. Cohen; E. Katz; A.E. Nelson (2002). "The Littlest Higgs". JHEP. 0207 (07): 034. arXiv:hep-ph/0206021. Bibcode:2002JHEP...07..034A. doi:10.1088/1126-6708/2002/07/034. N. Arkani-Hamed; H.C. Cheng; M. A. Luty; S. Mukohyama (2004). "Ghost condensation and a consistent infrared modification of gravity". JHEP. 0405 (05): 074. arXiv:hep-th/0312099. Bibcode:2004JHEP...05..074H. doi:10.1088/1126-6708/2004/05/074. N. Arkani-Hamed; S. Dimopoulos (2005). "Supersymmetric unification without low energy supersymmetry and signatures for fine-tuning at the LHC". JHEP. 0506 (06): 073. arXiv:hep-th/0405159. Bibcode:2005JHEP...06..073A. doi:10.1088/1126-6708/2005/06/073. N. Arkani-Hamed; S. Dimopoulos; G.F. Giudice; A. Romanino (2005). "Aspects of split supersymmetry". Nucl. Phys. B. 0709: 3–46. arXiv:hep-ph/0409232. Bibcode:2005NuPhB.709....3A. doi:10.1016/j.nuclphysb.2004.12.026. A. Adams, N. Arkani-Hamed, S. Dubovsky, A. Nicolis and R. Rattazzi,``Causality, analyticity and an IR obstruction to UV completion", hep-th/0602178. N. Arkani-Hamed, L. Motl, A. Nicolis and C. Vafa,``The String landscape, black holes and gravity as the weakest force", hep-th/0601001. N. Arkani-Hamed; N. Weiner (2008). "LHC Signals for a SuperUnified Theory of Dark Matter". JHEP. 0812 (12): 104. arXiv:0810.0714. Bibcode:2008JHEP...12..104A. doi:10.1088/1126-6708/2008/12/104. N. Arkani-Hamed; D.P. Finkbeiner; T.R. Slatyer; N. Weiner (2009). "A Theory of Dark Matter". Phys. Rev. D. 79: 015014. arXiv:0810.0713. Bibcode:2009PhRvD..79a5014A. doi:10.1103/PhysRevD.79.015014. N. Arkani-Hamed; F. Cachazo; C. Cheung & J. Kaplan (2010). "A Duality for the S Matrix". JHEP. 1003 (3): 020. arXiv:0907.5418. Bibcode:2010JHEP...03..020A. doi:10.1007/JHEP03(2010)020. N. Arkani-Hamed; J. Bourjaily; F. Cachazo; S. Caron-Huot; et al. (2011). "The All-Loop Integrand For Scattering Amplitudes in Planar N=4 SYM". JHEP. 1101: 041. arXiv:1008.2958. Bibcode:2011JHEP...01..041A. doi:10.1007/JHEP01(2011)041. N. Arkani-Hamed and J. Trnka, "The Amplituhedron",arXiv:1312.2007. N. Arkani-Hamed, T. Han, M. Mangao and L. Wang, "Physics Opportunities of a 100 TeV proton-proton collider", arXiv:1511.06495. "The Future of Fundamental Physics" five lectures given at Cornell October 4–8, 2010 in the Messenger Lecture series. "Introduction to Scattering Amplitudes" five lectures given at Cornell October 4–8, 2010, focus on n=4 supersymmetric Yang–Mills Theory. ^ "Curriculum Vita, updated 4-17-15", sns.ias.edu; accessed December 4, 2015. ^ Cornellcast: Nima Arkani-Hamed: Quantum mechanics and space-time. ^ "CFHEP". cfhep.ihep.ac.cn. Retrieved 2016-02-09. ^ Wolchover, Natalie (4 October 2015). "Visions of Future Physics". Wired. Retrieved 11 July 2018. ^ "Professor Nima Arkani-Hamed Wins Prestigious Physics Prize". Public Broadcasting Service. Retrieved August 30, 2012. ^ Wolchover, Natalie (4 October 2015). "Visions of Future Physics". Wired. Retrieved 5 October 2015. ^ Theoretical Physicist Nima Arkani-Hamed Appointed to the Faculty of the Institute for Advanced Study, ias.edu; accessed May 12, 2015. ^ "Book of Members, 1780-2010: Chapter A" (PDF). American Academy of Arts and Sciences. Retrieved April 25, 2011. ^ "Andrew D. White Professors-at-Large". Retrieved 2019-02-19. ^ New annual US$3 million Fundamental Physics Prize recognizes transformative advances in the field Archived 2012-08-03 at the Wayback Machine, fundamentalphysicsprize.org; accessed August 1, 2012. ^ "The Future of Fundamental Physics - CornellCast". CornellCast. Retrieved 2015-12-26. ^ "Introduction to Scattering Amplitudes - CornellCast". CornellCast. Retrieved 2015-12-26. Elizabeth Landau, "Colliding with nature's best-kept secrets", CNN, 9 May 2008 (accessed 10 May 008).